Gyrfalcons are notoriously difficult to keep alive, succumbing to a variety of ailments due primarily to the extreme nature of their native environment - they breed near and even north of the arctic circle throughout the northern hemisphere. We hypothesized that cool dry air might lower stress levels of birds which would normally only visit our area during the depths of winter. 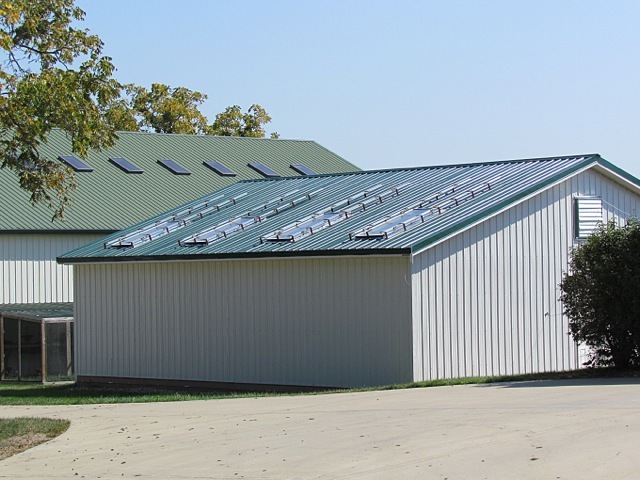 Since Kansas' summer is as extreme as our winter, we decided to enclose and air condition the barn once temperatures get to levels which might stress the birds. We have never lost a bird housed in this facility. 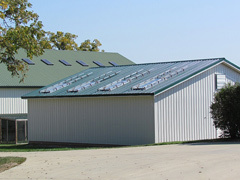 The breeding barn is modeled after concepts developed at Cornell University and later the Peregrine Fund. Larger chambers for the naturally paired gyrfalcons and smaller 8x10 enclosures for interaction with human-imprinted individuals. Photoperiod is not an issue, as skylights provide the necessary sunlight stimulation to the pineal and pituitary glands of the birds - and Kansas is far enough north that no supplemental light is needed to induce gonadotropism and subsequent breeding response. Even if your bird does not undergo a full wild hack, the hack or round barn, netted on top and equipped with cool rooms, is one of the largest in existence in the world. Your bird will be fully muscled from making laps around the five hundred foot interior circumference of the building. 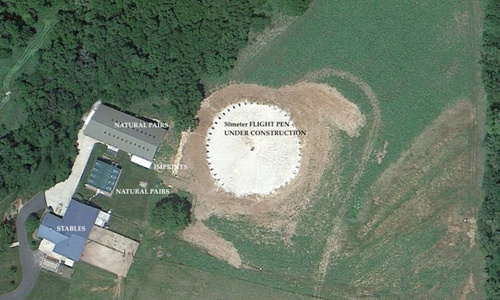 We have observed young birds flying up to five miles at one time in this incredible facility.